Flooding rice fields prevents certain weed species from developing and rice fields in Asia are major users of water resources. However, a looming water shortage in Asia means that rice growers will have to cut back on water use. Herbicides are being tested as a replacement for flooding for weed control in rice fields. Currently, sustainability of water resources is of major concern, and declining water availability threatens the sustainability of traditional flood-irrigated rice ecosystems. In Asia, it is predicted that 17 million ha of irrigated rice areas may have “physical water scarcity” and 22 million ha areas may be subject to “economic water scarcity” by 2025. It is, therefore, no longer feasible to flood rice fields for better crop establishment and weed control. 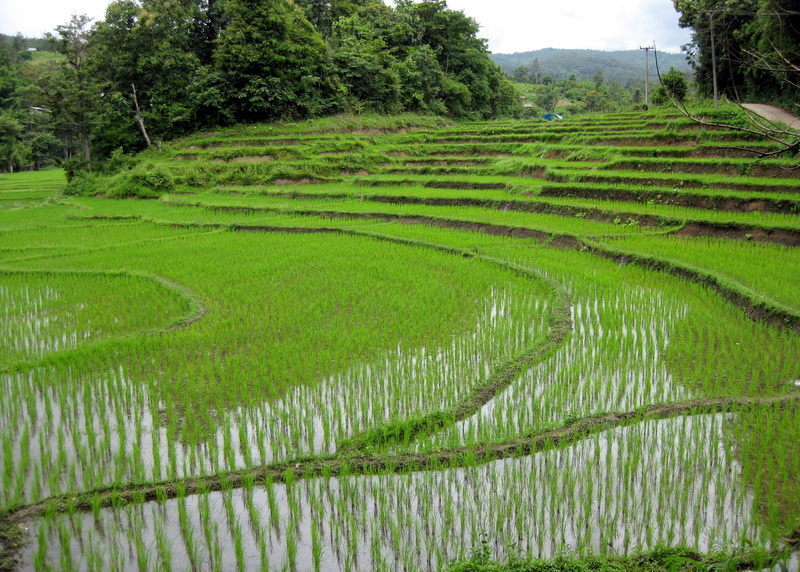 “Aerobic rice, growing rice in non-saturated and non-puddled aerobic soil, is a promising water-wise technique of rice cultivation under the context of ever-mounting water scarcity. But weed menace continues to be a severe problem in aerobic rice systems resulting in up to 90% reduction in grain yield. When direct seeded, rice seeds germinate simultaneously with weed seeds without any “head start” over germinating weed seeds, and the initial flush of weeds is not suppressed by flooding. …Therefore, effective weed management in aerobic rice has become a serious challenge for researchers and farmers. Eight commercial herbicide products were applied singly or as tank-mix or in sequence to evaluate their efficacy, rice selectivity and cost-effectiveness in aerobic rice. …Most of the herbicide treatments provided excellent weed control, and produced much higher net benefit than weedy or weed-free check. …Among the herbicide treatments, sequential application of Cyhalofop-butyl + Bensulfuron at early growth stage followed by Bentazon/MCPA at mid growth stage provided the highest weed control efficiency, productivity and net benefit. …Since manual weeding was not economic, herbicide rotation using the above chemicals may be recommended for effective weed management in aerobic rice. In the present study, cost of different herbicide treatments ranged from RM 167 to RM 469 ha-1 depending upon the price and rate of application, while manual weed control required a high investment of RM 2500 ha-1 for season-long weed-free checks. Authors: Anwar, P., et al. Title: Efficacy, phytotoxicity and economics of different herbicides in aerobic rice. Source: Acta Agriculturae Scandinavica Section B – Soil and Plant Science. 2012. 62:604-615. This entry was posted in Herbicides and tagged Asia, ecosystems, Herbicides, rice fields, sustainability, water resources, water scarcity, weed species by pesticide guy. Bookmark the permalink.